Lactose is the sugar found in milk and milk products. It is also added to some processed and prepared foods such as salad dressings. An enzyme called lactase is needed for your body to break down (digest) lactose. Secondary lactose intolerance occurs as a result of something else such as in inflammatory bowel disease, such as Crohn’s or Colitis. Celiac disease (antibody mediated gluten intolerance) or those with Celiac disease who have not been strictly following a gluten-free diet may also have secondary lactose intolerance. In these cases, the villi of the intestine (little hair-like projections that increase the surface area of the intestine) which contain the lactase needed to break down the lactose become damaged, resulting in lactose intolerance. For those with inflammatory bowel disease or Celiac disease, once their disease is better managed, the villi in their intestines heal, making them able to digest lactose again. Even a bout of stomach flu can result in temporary lactose intolerance. Congenital Lactose Intolerance – In rare cases, lactose intolerance is cause by a defective gene that is passed from the parents to a child, resulting in the complete absence of lactase in the child. This is referred to as congenital lactose intolerance. The severity of these symptoms depends on the amount of lactose eaten and the amount of lactase enzyme that the body produces. Most people with lactose intolerance can tolerate some lactose in their diet. This blood test measures your body’s reaction to a liquid that contains high lactose levels. This test measures the amount of hydrogen in your breath after consuming a drink high in lactose. If your body is unable to digest the lactose, the bacteria in your intestine will break it down instead. The process by which bacteria break down sugars like lactose is called fermentation. Fermentation releases hydrogen and other gases. These gases are absorbed and eventually exhaled. If you aren’t fully digesting lactose, the hydrogen breath test will show a higher than normal amount of hydrogen in your breath. This test is more often done in infants and children. It measures the amount of lactic acid in a stool sample. Lactic acid accumulates when bacteria in the intestine ferment the undigested lactose. 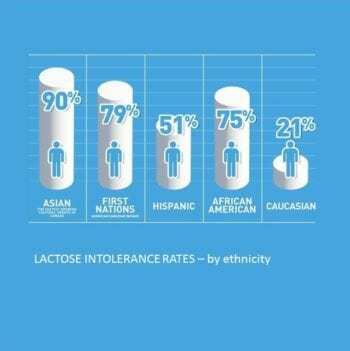 Those with lactose intolerance benefit from reducing the amount of lactose in their diet. Note: Products that contain lactic acid, lactalbumin, lactate and casein do not contain lactose. Some people are able to tolerate certain lactose-containing foods while other people with lactose intolerance cannot. Limit your intake of foods that cause you discomfort. If these amounts cause you discomfort, then try eat less. In Canada, “lactose-free” means that there is no detectable lactose in the food. “Lactose-reduced” means that at least 25% of the lactose in the product has been removed. It is important that if you are lactose intolerant to be sure to get enough Calcium and Vitamin D.
Calcium is a mineral that helps you build and maintain strong bones and teeth, and is also used in other parts of your body – to help your muscles work and is involved in maintaining your heartbeat. Adequate calcium intake throughout your life can help to prevent osteoporosis, a disorder that causes thinning of the bones until they are weak and fracture easily or break. Women are at greater risk of developing osteoporosis than men, particularly after menopause, because estrogen levels which act to maintain bone are reduced. Lactose-free sources of vitamin D include fish, liver and egg yolks. Being lactose intolerant does not mean you can’t ever have dairy – hard cheese and yogurt are naturally low in lactose and reduced lactose milk can be purchased at most grocery stores. Some people may not have any symptoms at all from regular milk or cream, provided they only have a small amount. If 1/2 cup (125ml) causes you discomfort, then try 1/4 cup. Finally, remember that Calcium and Vitamin D can be found in other foods besides dairy, such as canned sockeye salmon. Don’t forget that the bones are the best sources, so mash them finely and eat them along with the rest. Scrimshaw NS, Murray EB. The acceptability of milk and milk products in populations with a high prevalence of lactose intolerance. Am J Clin Nutr. 1988;48(4 Suppl):1079. Available at: http://www.ncbi.nlm.nih.gov/pubmed?term=3140651. Accessed on March, 6, 2015. Heyman, MB. Lactose intolerance in infants, children, and adolescents. Pediatrics 2006;118(3):1279-1286. Available at: http://pediatrics.aappublications.org/content/118/3/1279. full Accessed on February 23, 2015.